Sparks sits in his shack in an informal settlement in Kliptown smoking a pipe with his friends. Just above his head a tangle of wires snakes out of the shack in all directions, a veritable distribution board supplying power to hundreds of residents of one of Johannesburg’s oldest townships. His connections are illegal but it’s the only way residents here can access electricity. By BHEKI C SIMELANE. To residents of the informal settlement, Sparks – a nickname given to him by the community – is a hero. 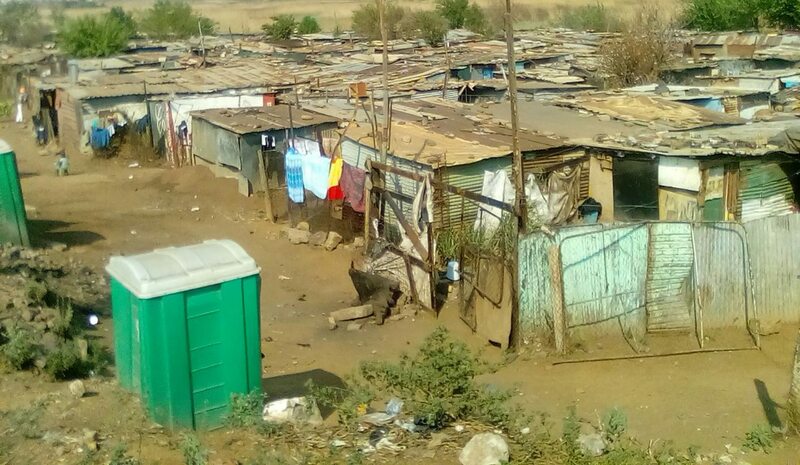 For nearly a decade, the 24-year-old school drop-out, has shimmied up and down electricity poles of Eskom and Passenger Rail Agency of South Africa (Prasa) providing shack dwellers with power where Eskom has failed to do so. He is the reason many children in the settlement can have a hot cup of tea before heading to school. And why in the winter, they are able to keep warm, despite their empty bellies. Sparks, who has so far evaded arrest, has no formal training and has never worked for Eskom, learnt the “trade” by watching and helping others who steal electricity. “This is not solely just about providing electricity for my community, I’m actually making a decent living out of it. I can buy clothes and feed myself,” Sparks, a crystal meth addict, said. Daily Maverick interviewed Sparks in his shack in the informal settlement following days of protest earlier this month when illegal connections were cut. By average standards, the shack is tiny – about the size a pit latrine toilet. Cigarette butts and dagga seeds lie discarded on the floor. Sparks sits on the filthy floor leaning against a makeshift bed. A small radio constantly breaks the silence with notes of Maskandi artist Shwi NoMntekhala’s once famous Zulu anthem, Ngafa, meaning I’m dying, filtering through. The Kliptown informal settlement is a railway line jump away from the historic Walter Sisulu Square where the Freedom Charter was signed in June 1955. Its dusty streets are strewn with litter, its shacks made of a mish-mash of materials, while dirty water – from residents use and sewage runs – through the settlement. The community believes the government has forgotten them. Their protests for housing and services have fallen on deaf ears and so now they rely on their own means to improve their lives – paying for stolen electricity is one option. Sparks charges his clients what he calls “cold drink”. Asked how much his “cold drink” is worth, he said he charges R50 and above for new connections and R20 for repairs. But Sparks’ distribution network has not gone unnoticed. Over a week ago, Prasa had a joint safety operation involving the Department of Community Safety and police to identify illegal connections, particularly as the theft of power often disrupts its train signalling network. Sparks’ bare wires run over the railway line short-circuiting Prasa signals and raising concerns for passenger safety. Security personnel knocked at Sparks’ door – luckily for him he was not home and the personnel left without entering. During the recent operation many of Sparks’ illegal connections from the Prasa poles were removed, plunging the community into darkness. This angered residents who went on the rampage looting a few stores in the area, vandalising Walter Sisulu Square and demanding that their cables be returned. Residents blocked roads with burning tyres and rubble, blocking traffic at all entrances to the township. Angry residents blame the ANC for failing to provide them with electricity in over two decades in power. “How do you expect a man who barely has a year as mayor to fix a problem in which others failed in over 20 years. People are just being unfair to (Herman) Mashaba,” said Bafana Nkomo. “Our government is convinced only pigs live here,” said 28-year-old Thobile Sithole, speaking to Daily Maverick a day after the protests. Electricity theft costs Eskom and other entities billions of Rands. EE Publishers Managing Director Chris Yelland says there are two distinct means by which electricity is stolen from Eskom – non-payment and theft. Non-payment involves municipalities failing to pay often resulting in the debt being written off, and fresh debt accumulated. Theft involves making connections without electricity meters installed thereby bypassing the billing process. “There are no simple solutions,” Yelland said, adding that it would take years to eradicate electricity theft which in his estimate amounts to tens of billions of rand. He says community members should be aware that stealing electricity is like stealing from one’s neighbour. “Enforcement of laws, proper and fair billing with sufficient community involvement will go a long way in alleviating electricity theft,” Yelland said. Eskom spokesperson Khulu Phasiwe says combating the scourge of electricity theft requires collaboration between interested stakeholders, especially Eskom, communities, and the police. He concedes that illegal connections remain a Herculean challenge for both Eskom and municipalities despite successful prosecutions. In a recent case an electricity theft syndicate kingpin was sentenced to 42 years in the South Gauteng High Court after being found guilty in December 2016. But Yelland says very few cases have been successfully prosecuted. “There have been only a few judgments. Courts have been very inefficient in dealing with electricity theft. It’s a huge socio-economic problem,” he said. The cost of electricity was a driving factor for residents where electricity supply was available to bypass this and opt for illegal connections. In Soweto, many poor households with an electricity connection struggle to settle their monthly bills. According to Eskom, Soweto has outstanding electricity debt of R5.3-billion, and the power utility has disconnected over 17,000 defaulting customers in Soweto for non-payment. It’s not easy to determine the cost of electricity for an average household. Yelland says this factor depends on every household’s level of income. Yelland estimates that a lower-end family would spend about R200 a month on electricity, while a more well-off household would spend about R2,000 a month. For residents of the Kliptown informal settlement, this is far too much and so they will continue to rely on Sparks.